8ID chief MGen. 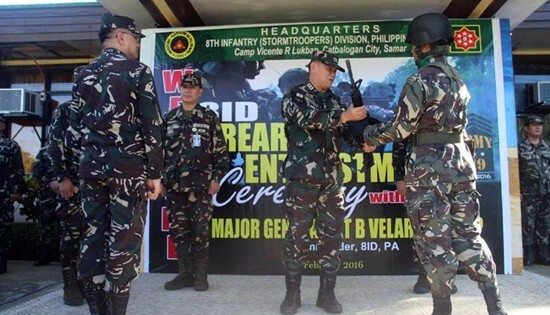 Jet Velarmino handed over the 444 new R4 rifles to LtCol. Hilarion Palma, Commanding Officer of 20IB during the Entrustment of Firearms at Headquarters 8ID, on February 3, 2016. CAMP VICENTE LUKBAN, Maulong Catbalogan City – In line with the Philippine Army’s goal of becoming well-equipped and acquiring a respectable image in Southeast Asia by 2016, the 8th Infantry (Stormtroopers) Division entrusts a total of 444 newly procured Remington USA R4 A3 Assault Rifles to the troops of 20th Infantry (We Lead) Battalion at 8ID Openiano Field here, 9 a.m. Wednesday, February 3. Maj. Gen. Jet B Velarmino, Commander, 8ID spearheaded the ceremonial entrustment of firearms together with Lt. Col. Antonio C Astilla, Commanding Officer of 8th Forward Service Support Unit and Lt. Col. Hilarion G Palma, Commanding Officer of 20IB. Col. Cesar M Idio, Assistant Division Commander; Col. Divino Rey C Pabayo Jr., Division Chief of Staff; and Col. Clifford Cyril Y Riveral, Division Inspector General were among others who witnessed and took part in the distribution of R4 rifles to the troops. The R4 rifle is a selective-fire (semi-automatic and automatic), gas-operated weapon that fires from a closed bolt. It is hammer-fired and uses a trigger mechanism with a 3-position fire selector and safety switch. With the procurement of the 5.56mm R4 rifles, the early models of M-16 and M-16A1 rifles will be replaced, since majority of which are already in poor condition and in need of replacement. The ceremonial entrustment of firearms symbolizes great responsibility and a reminder of every soldier’s duty to protect every Filipino, Maj. Gen. Velarmino said. “The issuance of the new 5.56mm R4 rifles will greatly boost the morale of troops and enhance their war fighting capability”, Velarmino added. PASAY CITY – Sen. Francis “Chiz” Escudero urged the Department of Social Welfare and Development (DSWD) to conduct a regular survey to determine if there is a need to update the current list of beneficiaries of the government’s conditional cash transfer (CCT) program, especially after disasters. Doing so will ensure that that only those deserving of the government assistance will benefit from the human development project, including victims of calamities that frequently hit the country, he said. “Marapat na magkaroon ng regular survey lalo na pagkatapos ng isang kalamidad, bagyo, El Niño, o La Niña na nakaapekto sa isang lugar para malaman sino ba ang mga nasalanta at bagong nangangailangan ng proteksyon at pagkalinga ng ating CCT program,” Escudero said. Currently, beneficiaries of the CCT, or the Pantawid Pamilyang Pilipino Program, are selected through the National Household Targeting System for Poverty Reduction (NHTS-PR), which identifies and locates poor households in every community. There were 4,353,597 families under the CCT program as of August last year, including 570,056 indigenous households. This year, the number of enrollees is projected to reach 4.62 million families, or 184,000 more than last year’s beneficiaries. The CCT program gives out a monthly stipend of up to P1,400 to each family beneficiary provided their children regularly attend school and the mothers, if pregnant, seek pre- and post-natal care, as part of government’s efforts to improve the health, nutrition and education of children from the poorest sector of society. The leading vice-presidential bet last year also urged the DSWD to strengthen its screening procedure for recipients of the CCT program following reports quoting a study by the Asian Development Bank (ADB), which showed that P19 billion of the P62 billion allocated for the CCT program in 2014 did not go to the poor. “We have to regularly do an assessment of the list of beneficiaries to ensure that we are not wasting resources to those who are not deserving of the aid intended only to the most vulnerable sectors of society,” Escudero said. The veteran lawmaker reiterated his support for the program, but vowed to push for the inclusion of a livelihood package for its beneficiaries if he wins the vice-presidential race in the May elections. Incorporating a livelihood component in the CCT, he said, will equip recipients with skills and training to help them become self-sufficient and help them wean away from government dole-outs. Two-thirds of DSWD’s P104.1 billion budget for 2016, or about P62.7 billion, will go to the development program. LtCol. Hilarion Palma, commanding officer of the 20th Infantry Battalion, participates in the closing ceremony and awarding of Pangkabuhayan Starter Tool Kits to 125 beneficiaries of TESDA-LNAIS community-based skills and livelihood program on January 29, 2016 at TESDA-LNAIS, Las Navas, Northern Samar. CATUBIG, Northern Samar – A community-based skills training program initiated by 20th Infantry (We Lead) Battalion, Technical Education and Skills Training Authority (TESDA) and Local Government Unit (LGU) of Las Navas, Northern Samar was culminated on January 29, 2016 in Las Navas Agro-Industrial School. 128 local beneficiaries from San Jose, Catubig, Barangay Dapdap, San Isidro and Del Pilar all of Las Navas, Northern Samar successfully completed the training requirements on Livestock Poultry Production, Raise Swine, Vegetable Crops, Sewing Draft and Cut Pattern, Bread and Pastry Making, and Motorcycle Engine Repair all NC-II TESDA certified. The beneficiaries received “Pangkabuhayan Starter Tool Kits” during their graduation as a jump-start to uplift their livelihood and economic condition. They extend their heartfelt appreciation for the soldier’s best initiatives on poverty alleviation. “We cannot always wait for what the government can provide us, rather, we can better help others by teaching them how to fish. In this way, the attainment of success and resolution of social issues will be resolved”, 20IB chief LtCol. Palma said. This, in return, the Philippine Army will get closer to the hearts of Nortehanons as we inspire and motivate them in bringing closer to all the government programs which is anchored on a people centered, comprehensive and sustainable approach toward the attainment of our core purpose in serving the people and securing the land. MAKATI CITY – Presidential aspirant Davao City Mayor Rodrigo Duterte and his running mate Senate Majority Leader Alan Peter Cayetano today pushed for the amendment of the Juvenile Justice and Welfare Act, whose loopholes they said are being exploited by crime and drug syndicates to use children for illegal activities. "Sobra na ang gulo kaya sobra na ang hirap ng tao. In many cases, drug traffickers use minors as couriers, a modus operandi made rather convenient by the law. Often times, these guys just go scot-free and grow up with no sense of accountability," Duterte said. "It's time to bring back order and keep our kids off the streets as we wage an all-out war against organized crime," he added. The tandem said the minimum age of criminal liability should be lowered from 15 to 12 years old, noting that moral autonomy usually develops as early as age 10. For repeat offenders, they said a new provision should be inserted so that those above 15 but below 18, who were subjected to a diversion program and are not first-time violators, shall be treated as adult offenders. Cayetano clarified, however, that minors would be placed in separate detention facilities and given the same rehabilitation, reintegration, and after-care services to ensure their normal growth. He said tough anti-crime measures must go hand in hand with restorative justice when it comes to children in conflict with the law (CCIL). "Sa kamay na bakal na pupuksa sa krimen, may kamay na aaruga sa nais magbago at magbalik loob sa batas. Ito ang tatak Duterte-Cayetano," the senator said. The duo is also studying the possibility of aggravating the punishment for adults who try to exploit minors and use them in carrying out their criminal activities. “Our goal in pushing for these amendments is to end the disorder in the streets. Through this, we reduce the number of crimes committed by minors and protect them from notorious criminals and syndicates who take advantage of their vulnerabilities,” Cayetano said. There are over 11,000 CICL in the country as of 2009, the Juvenile Justice and Welfare Council (JJWC) reported. The Department of Social Welfare and Development (DSWD) observed that most of these CICL are between 14 and 17 years old, but some cases involve much younger children. So grieved the victims of martial law, speaking through Bonifacio Ilagan, vice-chairperson of SELDA (Samahan ng Ex-Detainees Laban sa Detensyon at Aresto), himself a torture victim of the Marcos dictatorship. SELDA is up in arms against the term extension of the Claims Board which was created by Pres. Noynoy Aquino to process applications of martial law victims for indemnification and non-monetary recognition. The martial law victims and their surviving kin held a picket at the House of Representatives on Monday, in protest against House Bill 6024, providing pensions for members of the Claims Board and a two-year extension of their term. Selda has staunchly opposed the provisions in the amendment providing lump sum retirement benefits and a monthly pension to members of the Claims Board, which shall be deducted from the P10 B allotted for the indemnification of martial law victims. This has been dropped in the proposed amendment. Ilagan explained that while Selda recognizes the large number of victims who applied for reparation, the extension merely serves to secure the tenure of the Aquino-appointed officials and eats up the funds allocated for the victims of martial law. House Bill 6024, filed by the Akbayan Party-list, was approved last week to amend RA 10368, or the Human Rights Victims Recognition and Reparation Act. The amendment effectively further delays compensation until 2018. “Many of the ageing victims are sick. They are impoverished and in dire need of financial assistance. They are no different from the multitude of the elderly SSS pensioners who have been deprived of help by a callous and anti-people government,” said Ilagan. Selda maintains that members of the Claims Board, headed by PNP retired Gen. Lina Sarmiento, have benefitted more than enough at the expense of the victims of martial law. From the fund for the victims, each member of the board receives a monthly P31,000.00 salary, excluding allowances and other benefits. This, despite the fact they only processed 11,000 applications in 11 months, between November 2014 to December 2015, or an average of about 800 applications a month. QUEZON CITY – “The one billion pesos slashed from the item of ‘Family Health and Responsible Parenting’ of the 2016 budget of the Department of Health is only the tip of the iceberg,” according to Health Alliance for Democracy (HEAD). Based on comparisons of the proposed and approved budget, enormous amounts were moved around for political considerations rather than for health purposes. Instead, more than 2.9 billion pesos were added to the budget of Rural Health Units and 3.3 billion pesos were added for Public/Local-Government Unit (LGU) Hospitals. This puts the money under stronger control of local chief executives, particularly the mayors and governors. “In the context of the coming elections, such spurious movements of money should be scrutinized, especially when the presidential candidate of the ruling party was also the former Department of Interior and Local Government secretary.” Carabeo said. HEAD also noted that more than 471 million pesos of HFEP funds were added to the budget of “other health facilities”, which, upon closer inspection, covers only the National Capital Region, specifically the DOH Central Office. “Given the DOH’s problems in utilizing its budget efficiently, what will prevent the Aquino government from simply declaring these funds as ‘savings’ and used elsewhere, as we have seen in the past?” Carabeo asked. MANILA – Greenpeace Southeast Asia today announced the appointment of high-profile climate activist Naderev ‘Yeb’ Saño as Executive Director. Yeb has an exemplary track record participating in and leading the world’s environmental movement. Greenpeace is confident he will boost the organization’s work to ensure a greener, cleaner and more peaceful future for all people in Southeast Asia, including global efforts to tackle catastrophic climate change. Greenpeace Southeast Asia Regional Board Chair, Suzy Hutomo said: “We are pleased to welcome Yeb Saño as Executive Director of Greenpeace Southeast Asia. We are confident that he will advance work to change attitudes and behaviors to protect and conserve the environment and promote peace to protect our fragile earth from destruction. Together we will achieve our goal of environmental justice." Born in Manila, the Philippines, Yeb Saño has dedicated his career to ending climate change. His history of climate activism spans over 20 years. He headed up the World Wildlife Fund’s energy and climate program before he was appointed as the Philippine’s Climate Change Commissioner in 2010. In his capacity as Lead Climate Negotiator for the Philippines at the UNFCCC in Warsaw, 2013, he raised urgency for immediate action on climate change. He urged countries around the world to deliver strong and binding climate commitments. At the start of this conference, he embarked on a two-week fast, joined by thousands of people around the world. He also made an impassioned speech as he addressed delegates in Warsaw. Just days before, Typhoon Haiyan ripped through the Philippines, killing more than 6,000 people. It was the strongest storm of its type ever to be documented. Saño appealed to officials to take seriously the issue of climate change. Yeb joins Greenpeace with the firm belief that the solution to the world’s ecological crisis does not exist in the corridors of power, but by catalyzing an interconnected, global movement of people. “Our planet is facing threats that we’ve never seen before, and there is no question that we must find ways of living with our planet within its ecological limits. That is why I decided to have my next journey with Greenpeace. PASAY CITY – Sen. Francis “Chiz” Escudero expressed hope that the bill seeking to modernize the National Bureau of Investigation (NBI) will be enacted into a law in order to strengthen government efforts in stopping deadly attacks on media practitioners and activists in the country. Escudero issued the statement after the New York-based Human Rights Watch (HRW) released recently its World Report 2016, which included killings of activists and media workers in the Philippines. As the author of Senate Bill No. 2950 – or An Act Modernizing the National Bureau of Investigation, Providing Funds Therefor, And For Other Purposes – Escudero said he is optimistic that the new mandate of the NBI will help the agency solve extra-judicial killings faster. “I am of the belief that the best deterrent to crime is still the speedy resolution of cases. With a modernized NBI, I am confident that we will be better equipped in fighting and solving crimes,” said the leading vice-presidential candidate. Approved on third and final reading by the Senate on Jan. 25, SBN 2950 defines and categorizes the priority cases that should principally be referred to the NBI, which include extra-judicial/extra-legal killings committed by the state’s security forces against media practitioners and activists in the country. Also among the priority cases under the measure are human trafficking cases in airports; killings of justices and judges; violation of the Cybercrime Prevention Act; cases referred by the Inter-Agency Anti-Graft Coordinating Council; violation of the Anti-Dummy Law; and violation of commercial, economic, and financial or white-collar crimes. Escudero, former chair of the Senate Committee on Justice and Human Rights, noted how the country has been severely criticized even in the international community because of numerous unsolved cases of violence against journalists, activists and judges in the country. “We should not tolerate this culture of impunity in our country because it does not only concern the violation of human rights but it also hurts the country’s image among potential investors abroad,” he said. In its 659-page report, the Human Rights Watch said there were at least 13 tribal leaders and tribal community members allegedly killed by assailants often linked to the military or paramilitary groups in the first eight months of 2015. The international human rights watchdog also labeled 2015 as “another deadly year for Filipino journalists,” with eight media practitioners killed in the first 10 months of last year. The group also noted in its report the lack of resolution to media killings in the country. “Task Force Usig, a unit created by the Philippine National Police in 2007 to investigate these murders, has not been able to fully investigate most of these killings, mainly due to the lack of witnesses willing to publicly identify themselves and share information with police,” Human Rights Watch’s said. “Although the task force has secured the conviction of suspects in eight of the 51 cases it has documented since 2001 – a conservative figure since Usig does not classify videographers and producers as ‘journalists’ – no one responsible for planning and executing such attacks has been arrested or convicted,” it added. Escudero said his bill aims to strengthen the NBI as an institution to make it more responsive to the demands of the times. “With modern equipment, skilled agents and defined responsibilities, I am confident that the NBI will be in a better position to help our security forces in combating crimes and resolving incidents of extrajudicial killings in the country,” Escudero said. In 2013, the Philippines was named as the third most dangerous country in the world for journalists by the London-based International News Safety Institute just behind the strife-torn Syria and Iraq. As of June 2014, a total of 145 media workers in the country have been killed in the line of duty since 1986, including at least 33 in the Ampatuan massacre of November 2009, according to the Center for Media Freedom and Responsibility. STA. RITA, Samar – The 52nd Infantry (Catch ‘Em) Battalion under the leadership of Lt. Col. Nedy C. Espulgar has fully operationalized its “organic farming project” inside Battalion headquarters in Brgy Caticugan, Sta. Rita, Samar since August last year. This innovative project which showcases a people-centered integrated organic farming is aimed to help uplift the social and economic well-being of soldiers, CAFGU Active Auxiliary (CAA) members, and their dependents. Lt. Col Espulgar is the former commander of 19th Infantry (Commando) Battalion stationed in Kananga, Leyte. In his stint as 19IB commander, he promoted a unique approach to peace and development through sustainable agriculture. Various farmers’ organizations, youth and women sectors in the hinterlands of Leyte were clustered to become organic food producers and farmers. He also made a significant role in the integration of former rebels into the mainstream society through extensive in-house trainings and seminars on farming. Known as Peace Advocacy for Collaboration and Empowerment, the project has provided livelihood opportunities and extra income for the growing number of ex-rebels. The centerpiece of the “organic farming project” is the production of high-value crops (fruits and ornamental plants) such as eggplant, lettuce, potato, upland spinach, bitter gourd, bell pepper, herbal plants, and different varieties of ornamental plants. Sooner, the endeavor will expand to livestock production of chickens and swine and “Tilapia” aquaculture farming. The official launching for the project is tentatively scheduled in the second week of February. “This is more than just an ordinary organic farm. We earn the respect, trust and support of our constituents because we develop their ideals and aspirations and give them opportunities to live peacefully and become active partners in peace and development”, Espulgar said.